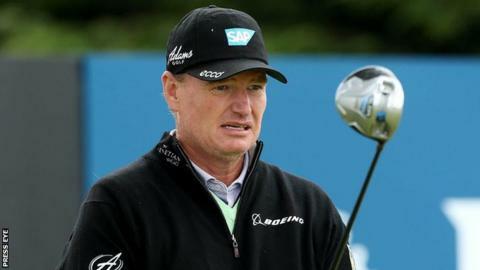 Ernie Els is back at the Irish Open after a 17-year absence at a Royal County Down venue which he says is one of the game's top three links courses. Els was amazed to be told on Wednesday that he had not competed in the Irish Open since 1998 at Druids Glens. "That's incredible," said the four-time major winner, 45. "But coming here is as good as it gets. We pros talk about a list of best links courses and (Royal) County Down is always in the top three." Indeed, Els believes that two of the top four links venues on the planet are in Northern Ireland with the two-time Open champion also a big fan of Royal Portrush, which is set to host golf's oldest championship again in 2019. "Those two courses here are just phenomenal tests. My personal favourites for obvious reasons are Muirfield and Lytham (where I won my Open titles) and then I like County Down just ahead of Portrush. "Royal County Down is just an unbelievable layout. It's so natural with quite a few blind shots. Rory McIlroy is confident that his off-course commitments at this week's Irish Open will not hinder his challenge at Royal County Down. "They haven't changed a lot of things around here. It's just the most unbelievable land for a golf course. The dunes are unreal." 2010 US Open champion Graeme McDowell said on Wednesday that he believed Royal County Down could also be added to the currently 10-strong Open Championship rota although it remains to be seen whether the venue could support the required infrastructure for the major. "I really believe that County Down can be a runner for an Open Championship," insisted the Northern Irishman. With the forecast not particularly good for the coming days, Els believes that the venue will present a "huge test" for the host of world stars competing in the event. As was the case with so many of the big names competing this week, Els was convinced to make the trip to Northern Ireland by the persuasive powers of world number one and local hero Rory McIlroy. "Rory and myself are good friends and it was an easy decision even though I missed my daughter's birthday party yesterday," added Els. "He has helped us so much in our charity work. We run a foundation event in South Africa and after he turned pro, he played some of our events down there. "We also run an event in the US and he always plays in every single one. When you have the world number one in your field, it's easy to ask people for money."